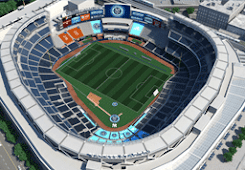 NYC is Blue: Video: "Big Soccer in the Big Apple"
MLS just posted this Insider video, showing behind-the-scenes footage of the announcement of NYCFC. It begins with the press call with MLS Commissioner Don Garber, Yankees President Randy Levine and Ferran Soriano, the CEO of Manchester City FC, and continues as the three men meet with reporters. We also hear from Claudio Reyna. In between, they share a little of the owners' philosophy.